Entrepreneurs Brief Guide - In today's business world, it is not possible for us to accomplish one goal before moving on to the next. Most of the time you will be working simultaneously on various short tasks which are requisite to accomplish a larger goal. Then how do you decide which task to start and complete first? The answer to this can be found by prioritizing your tasks. 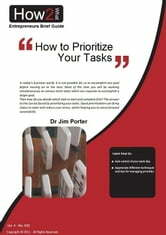 Good prioritization can bring chaos to order and reduce your stress, whilst helping you to move forward successfully. In 30 minutes, learn how to: (a) Gain control of your work day and (b) Appreciate different techniques for managing priorities.